Non-Medicinal Ingredients: Lauric acid, microcrystalline cellulose, magnesium stearate. 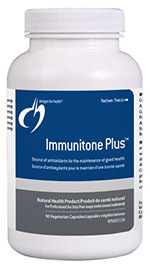 Immunitone Plus™ is an herbal formula that is designed to support healthy immune system function. It contains herbs that support normal natural killer (NK) cell activity and the balance of cytokines, which are the regulatory proteins released by immune cells as part of a normal immune system response. The standardized herbs in this formula contain optimal and consistent amounts of the most active ingredients. Adults: 3 Capsules once per day with meals, or as directed by your health care practitioner. Consult a health care practitioner for use beyond 12 weeks. If symptoms persist or worsen, consult a health care practitioner. Consult a health care practitioner prior to use if you are taking immunosuppressants, if you have an auto-immune disorder, kidney disorder, blood pressure problems, a progressive systemic disease, immune system disorder such as tuberculosis, collagenosis, multiple sclerosis, AIDS and/or HIV infection, a liver disorder or develop symptoms of liver trouble (such as abdominal pain, dark urine or jaundice), an iron deficiency or diabetes. Consumption of Goldenseal with alcohol, other medications and/or natural health products with sedative properties is not recommended. Do not use if you are pregnant or breastfeeding, or if you are allergic to plants of the Acanthaceae family. For use beyond 3 months: Dizziness, irritated skin, nausea and of the Acanthaceae family. For use beyond 3 months: Dizziness, irritated skin, nausea and diarrhea have been known to occur; in which case, discontinue use. May cause constipation or gastrointestinal discomfort, in which case, discontinue use.